Congratulations to the UW graduating class of 2013! We – your fellow students, faculty, alumni, and members of the greater Seattle community – write to recognize your achievement but, also, to share with you and with commencement speaker, Jon Huntsman, our serious concerns about Mr. Huntsman’s connection to Caterpillar Inc. and to human rights abuses in Palestine/Israel. The University of Washington has invited Jon Huntsman to give the Commencement keynote address that will set the tone for graduates’ first steps into their post-university lives. We know Mr. Huntsman most recently as one of the 2012 Republican presidential hopefuls. But in addition to a long and prestigious career in American politics, Jon Huntsman serves on the board of Caterpillar Inc. (CAT), an American firm that manufactures and distributes bulldozers and civil engineering tools. The CAT logo has become ubiquitous on most construction sites around the country. Most students are not familiar with CAT bulldozers that are part of the daily lives of Palestinians living under Israeli occupation. For decades, CAT has sold specially militarized equipment to the Government of Israel used in the systematic demolition of Palestinian homes, the death and injury of unarmed Palestinian and international civilians, the uprooting of olive trees and destruction of agricultural land, and the expropriation of Palestinian territory through the construction of illegal Jewish-only settlements and a separation-annexation wall. Amnesty International, the United Nations Special Rapporteur on Human Rights, and Human Rights Watch have all reported on and denounced Israel’s breaches of international humanitarian law and CAT’s complicity in human rights violations. 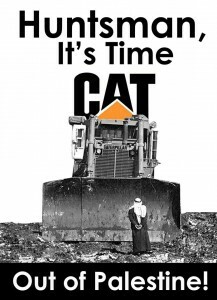 The CAT brand and its bulldozers have become a symbol of destruction in Palestine. CAT’s responses to this overwhelming evidence have been inadequate and contrary to its own Code of Worldwide Business Conduct. CEO Doug Oberhelman has said, “How our customers use [the bulldozers] is their business. We can’t stop them.” But CAT designs the bulldozers to be weaponized. CAT has a choice. The corporation has a moral and legal responsibility to cease sales of CAT equipment used in a clear pattern of human rights abuses by the Israeli government and military. In 2003, Rachel Corrie, a nonviolent human rights activist and observer, and Washington State resident, was killed by a Caterpillar D9R bulldozer (operated by an Israeli soldier) as she tried to prevent the demolition of a Palestinian family’s home in the Gaza Strip. A student at The Evergreen State College, Rachel did not live to attend her own graduation in June 2003. Numerous Palestinian civilians have also been killed when their homes were collapsed upon them by D9s. So, on the occasion of this UW Commencement, we ask both Mr. Huntsman and the graduating class to address the continuing harm caused by Caterpillar’s machines in Palestine. We request that Jon Huntsman meet with UW representatives and the Corrie family to learn about the concerns of the Washington State and UW communities and to convey these to fellow Caterpillar Inc. board members. We are eager to share the profound impact the company could have by suspending sales to the Israeli military—implementing due diligence in their sales to any customer, until guarantees are received that their equipment will not be used to violate international law or commit human rights abuses. To the Class of 2013 Graduates, again, our congratulations! Please use this momentous occasion in your lives to join us in encouraging Jon Huntsman to do the right thing! For more information on how to help, go to www.superuw.org. Find us on twitter at #uwCATfree. News on UN High Commissioner for Human Rights Report, 2004: Link Here. Amnesty International Report, 2004: Link Here. Human Rights Watch Report, 2010: Link Here. The Presbyterian Church USA Mission Responsibility Through Investing (MRTI)Committee Report, 2011: Link Here.